This project is about viscosity of fluids. In this project I have taken some engine oils (which are not recommended for a diesel car) and tested them to find that which one of them is best suitable for a diesel car. I have done this by the help the experiment performed on viscosity of fluids. To compare the viscosity of different engine oils at a given temperature and thereby determine the most effective one for a diesel car. Why is engine oil used and how does it work? Motor oil or engine oil is used for lubrication of various internal combustion engines. The main function is to reduce wear (deterioration due to friction) on moving parts. When the pistons of the engine move back and forth they wear out the sides of the cylinder block, the oil creates a layer that lets them move smoothly. It also cleans, inhibits corrosion, improves sealing, and cools the engine by carrying heat away from moving parts. How is engine oil rated? How it is rated: Engine oils can be made of singular polymers (single grade) or multiple polymers (multi grade) and are rated accordingly. These differ in their viscosity, and therefore, in their uses. The SAE gives a single grade to engine oils. However, single grade oils cannot withstand the variety of conditions vehicles today are put through. Therefore, multi grade oils are more popular. These behave as differently rated single grade oils under different temperature conditions. Under cold conditions, the oil is thin enough to grease the engine and allow for proper ignition and running. Under high engine temperatures, the oil only thins to a particular extent so as to keep the engine sufficiently lubricated. Multi grade ratings are in the form xWy (eg. 5W40). 'W' is the winter rating which shows that the oil has been tested to work under cold conditions. The 'x' number tells us which single grade polymer the oil behaves like under cold conditions. The lower the number, the less viscous the oil and better the performance in low temperatures. The 'y' number tells us the single grade polymer as much as which the oil thins at high temperatures. The rating is primarily based on the viscosity of the engine oils. 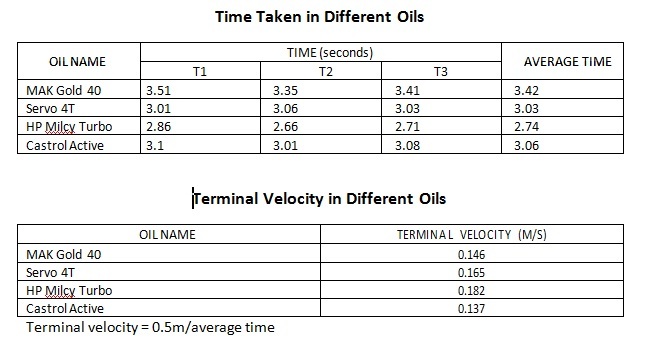 Hence, it is evident that viscosity is the single most important characteristic deciding the efficiency of these oils. Different polymer combinations are made to essentially alter the viscosity of the oil at different temperatures. It is the property of a fluid by virtue of which an internal resistance comes into play when the fluid is in motion, and opposes the motion between its different layers. In a vehicle engine, viscosity determines how easily the motor oil flows to different parts of the engine. In the equation, the constant of proportionality (η) is called the coefficient of viscosity, which varies for every fluid. This is the maximum velocity acquired by the body falling freely in a viscous medium. Consider a small sphere of radius (r) and density (ρ) falling freely in a viscous medium (coefficient of viscosity η and density σ). 2. The jar was cleaned and filled with the motor oil up to a 97 cm (850 ml) marker. 3. 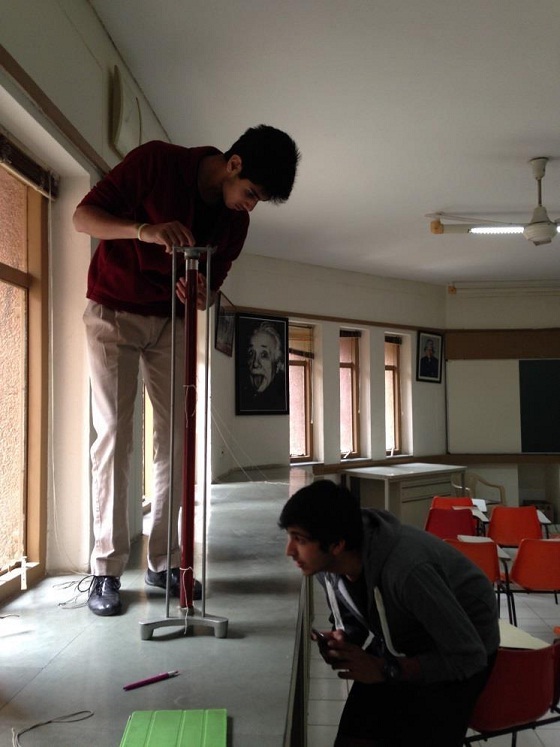 Two loops of string were tied around the lower part of the glass tube, 50 cm apart: one at 65 cm and the other at 15 cm. 6. The timer was started when the shot reached the first string (at terminal velocity) and stopped when it reached the second one. 7. Three readings were taken for each engine oil and the observations were noted. SAE 40 rating, but they have different viscosities. The rating of engine oils therefore is based on a factor known as kinematic viscosity. Kinematic viscosity in turn is the ratio between dynamic viscosity (absolute viscosity) and the density of the liquid. These values are then divided into ranges and then SAE ratings. The kinematic viscosity however will not be constant at a given temperature. The density of liquids decreases with increase in temperature. This is because when temperature rises so does volume. When volume rises the density decreases. 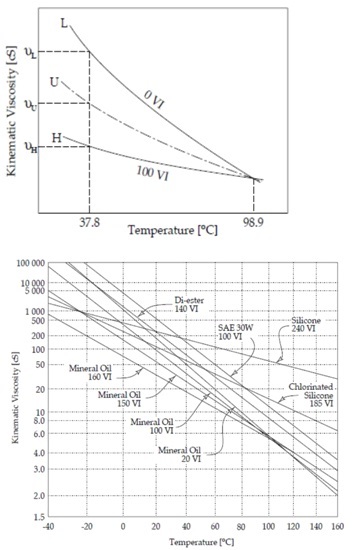 Therefore we must also look at the coefficient of thermal expansion of engine oils in order to calculate the new density and in turn, kinematic viscosity. 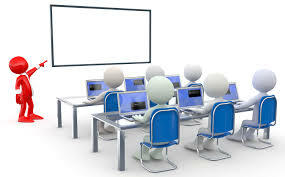 Dynamic viscosity is the coefficient of viscosity of a liquid which we have calculated. This equation puts all the values of kinematic viscosity of the oils in the SAE 40 Range. Therefore any of the oils may be used as SAE 40 is suitable for prolonged use in cars. But in order to compensate for the grime build-up and the fact that the engine may have to start in colder weather as it is specified that the car is on its way to a hill station, the least viscous oil should be used. This oil will ensure it doesn’t get too thick at lower temperatures and will still flow. cSt, HP Milcy Turbo is the ideal engine oil.